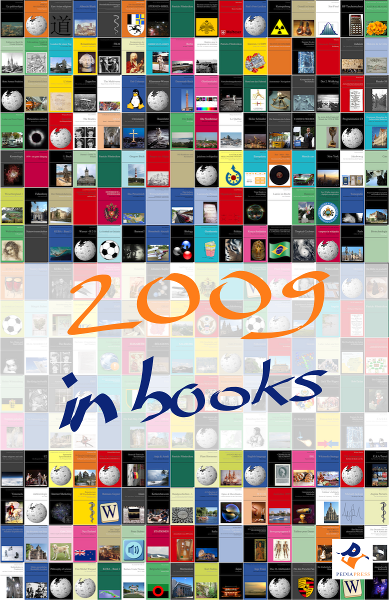 PediaPress Blog: Hello 2010, What's Cooking on the Wiki Book Front? Hello 2010, What's Cooking on the Wiki Book Front? So here we are, about two weeks within 2010. The beginning of this year has been quiet, but nonetheless interesting. As we've finally settled down after holidays, family parties and much eating (well, at least for me, France is famous for that right? ), it is time to look back on 2009 and more important, to look ahead into 2010. It's a new decade after all, what does it have in store for us? 2009 brought us quiet but steady growth. We've worked on the software all year round, while more and more people have been putting together and designing their custom wiki books. Here are some figures that describe the year 2009. We're thrilled to see that so many people across the world are interested in making wiki books. Geographical diversity was not the only one. The topics of the books made were also extremely varied. They ranged from "The Philosophy of Science" to "London for a Day" to "Beware of the Cuco! - Origins of Urban Legends and Other Folklores", in other words, from academic to personal to esoteric. But what you liked most in 2009 was definitely the introduction of color covers. As shown in our little mosaic, color covers make for really personal books. That was for 2009, 2010 will bring its new load of great improvements and cool changes. In the next three months, we hope to make the Book creator open to all visitors of the English Wikipedia (and not only to logged in users). This will also prompt a refactoring of the Community Book Catalog. We want to produce the tools to make it more attractive so that the books put together by the Wikipedia Community are more visible for visitors. We are also working on a new version of our website, which will introduce many new possibilities. You will be able to have a user account to store your custom books and follow up on your oders. We will propose affiliate programs, which will allow you to become a partner of PediaPress via your website or wiki. We will continue looking for local partners to ensure fast delivery in your country. And, last but not least, we are planning to introduce the option of printing color contents, as well as hardbacks. Many improvements which will make the PediaPress experience even more enjoyable and complete. We're looking forward to this new year and hope you will join us in making PediaPress your service of choice!